Italian Hebrew scholar; born in Modena in 1529; died in Ferrara in 1611. From the fact that Azariah dei Rossi in his "Meor 'Enayim," p. 98b, refers to him as ("a man of Modena"), it is assumed that he was a native of that city. The mere family name De Modena, when not implying actual birth or residence, is expressed in Hebrew by ("of Modena"). The descendants of this family now bear the simple name "Modena." The family originated in France, whence it emigrated to Italy during one of the expulsions of the Jews. Mordecai, the father of Abtalion, was a very learned rabbi and distinguished physician in Bologna. 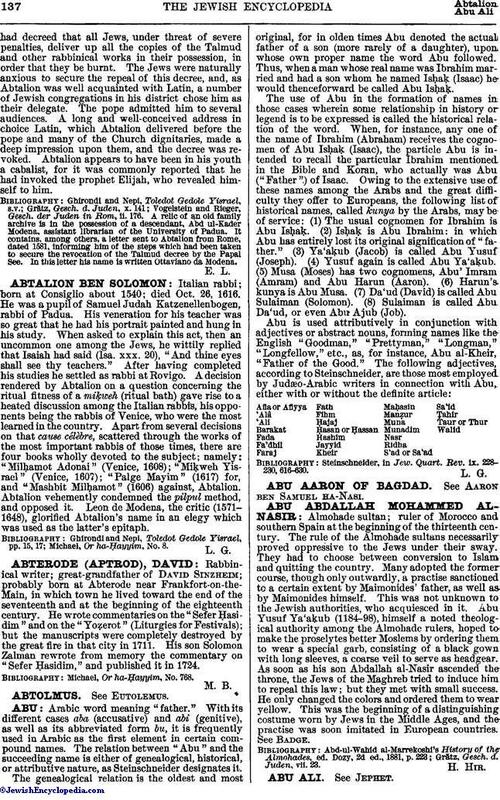 Abtalion, the youngest of four sons, removed to Ferrara, where he distinguished himself through his knowledge of Hebrew and his secular attainments. Both he and his father seem to have written much, though nothing has been printed. Abtalion is remembered chiefly because of his intercession with Pope Gregory XIII., who in 1581had decreed that all Jews, under threat of severe penalties, deliver up all the copies of the Talmud and other rabbinical works in their possession, in order that they be burnt. The Jews were naturally anxious to secure the repeal of this decree, and, as Abtalion was well acquainted with Latin, a number of Jewish congregations in his district chose him as their delegate. The pope admitted him to several audiences. A long and well-conceived address in choice Latin, which Abtalion delivered before the pope and many of the Church dignitaries, made a deep impression upon them, and the decree was revoked. 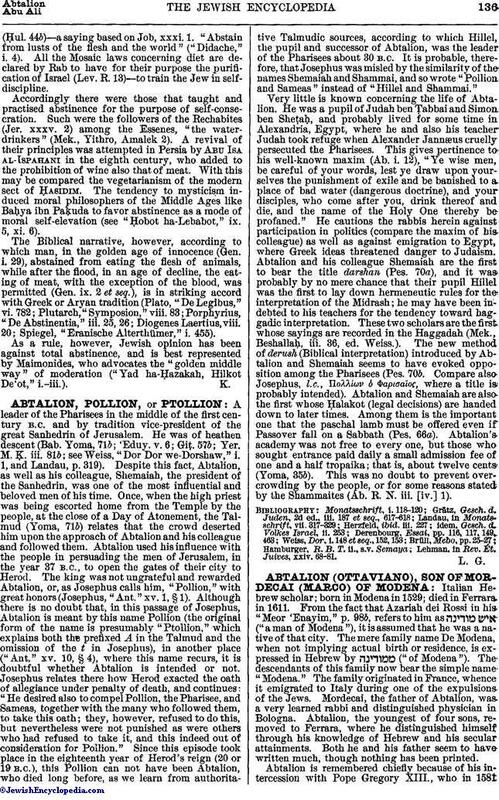 Abtalion appears to have been in his youth a cabalist, for it was commonly reported that he had invoked the prophet Elijah, who revealed himself to him. Vogelstein and Rieger, Gesch. der Juden in Rom, ii. 176. A relic of an old family archive is in the possession of a descendant, Abd ul-Kader Modena, assistant librarian of the University of Padua. It contains, among others, a letter sent to Abtalion from Rome, dated 1581, informing him of the steps which had been taken to secure the revocation of the Talmud decree by the Papal See. In this letter his name is written Ottaviano da Modena.